The Summer 2019 collection presented by INGIE Paris reflects its new creative impulse perfectly. The extreme refinement is inspired by the influential and sophisticated women of today, creating the world of tomorrow. As would a painter, INGIE Paris plays on the vivacity of colors, the delicacy of textures and the extravagance of forms and proportions to dress women with sculptural creations as captivating as works of art. 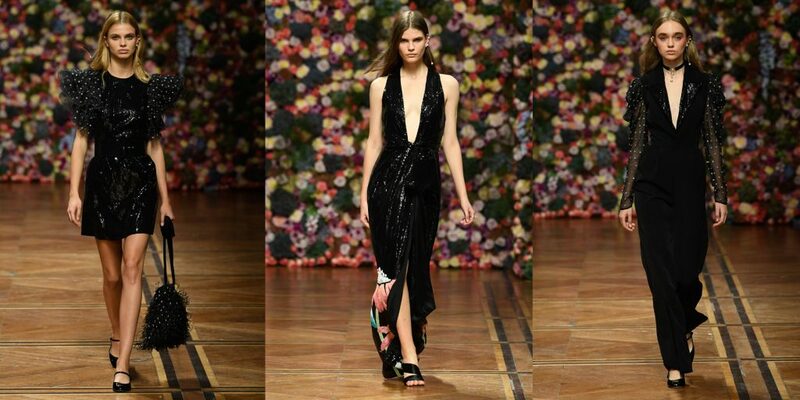 The flower, pink and gold remain central to this Summer collection, signatures of the house. 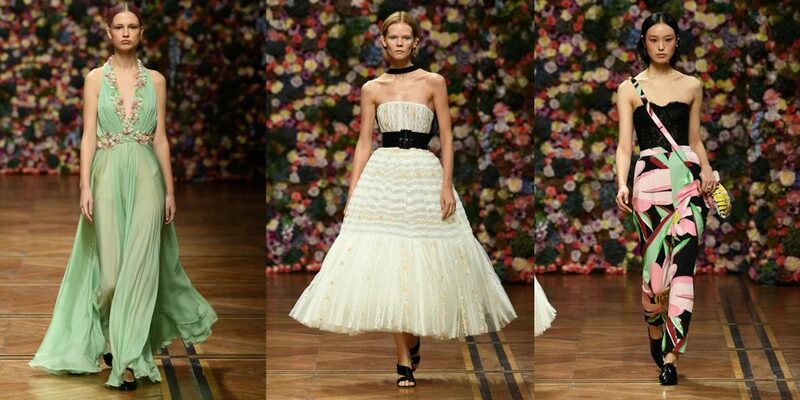 An oversized, multi-colored print on the top of a long, cold shoulder cape, entirely stitched with sequins, the flower is also delicately embroidered on a white tulle hooded cape that is fastened with an oversized knot, or the train of a dress with a structured bustier in black pleated tulle adorned with ribbons. INGIE Paris has a keen eye for embellishments, doubled with an exceptional technical mastery for the structure of every garment by playing on aerial volumes. 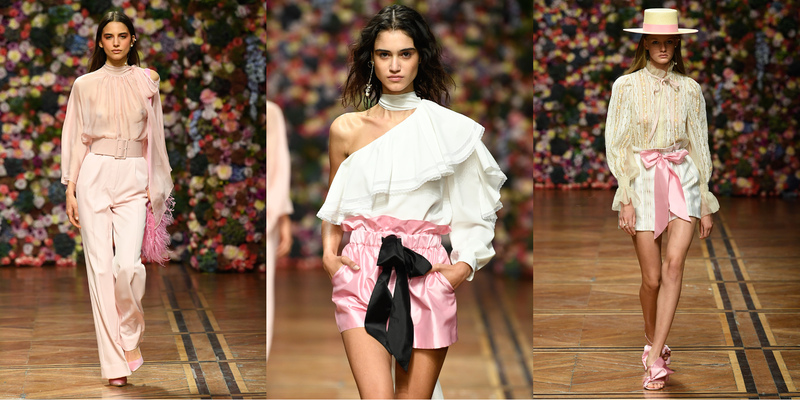 Organza balloon sleeves, covered with Swarovski crystal embroidery, bring depth to a jumpsuit with a sequined collar lapel, whilst the wavy sleeves of a mini-dress flare out in duchess pink, dressed with extra-large ruffles to create roundness and movement. An artistic perception of fashion that is confirmed by INGIE Paris with the choice of noble, light materials; tulle, organza or duchess satin which are draped, pleated, folded, covered in crystals, feathers, sequins or subtle embroidery in order to play on transparency or to reveal the shine.A radiance that is sublimated by a vibrant yet bold palette of colors; pink and sea green that awaken the chic neutrality of black. This coherence, in turn, is found in the development of accessories; earrings, or a choker trimmed with floral motif pendants and pearls. A gilt wire belt shaped to carry the INGIE Paris name at the waist or the sculpted heel of a pump. Feathers or crystals reveal the brand name, covering pockets with colors and materials matching those of the silhouettes. At a time when the fashion world is seeking to seduce the East, INGIE Paris pins confidence in its originality and sets out to conquer the West by unveiling a Spring/Summer 2019 collection that is charming and fresh with a contemporary aesthetic. Dazzling both by day and by night the INGIE Paris woman embraces the world with ever more femininity, a femininity that is both implicit and uninhibited.